The ink is barely dry on Nicolas Anelka's groundbreaking contract with Shanghai Shenhua but already the Chinese Super League club is working to pull off another major transfer coup by signing his Chelsea team-mate Didier Drogba. Anelka has agreed a two-year contract worth £175,000 a week having been told he is no longer wanted by Chelsea coach Andre Villas-Boas and will move when the transfer window opens. Shanghai Director Zhou Jun told Reuters in an interview today his club had already spoken to Drogba and were ready to continue their lavish spending if the Ivory Coast international was prepared to switch West London for the Far East. Anelka will become the biggest name to ply his trade in the world's most populous nation when the striker joins Shanghai Shenhua in January. Zhou, who also expects former Bordeaux coach Jean Tigana to arrive as manager in January, said bringing in foreign talent was essential for the growth of Chinese football, which has been blighted by scandals and corruption in recent years. "Drogba is an excellent player. We got in touch with him two weeks ago," Zhou told Reuters near Shanghai's Pudong training ground. "From our club's perspective, we have this to say - if he is willing to come, we will definitely welcome him." 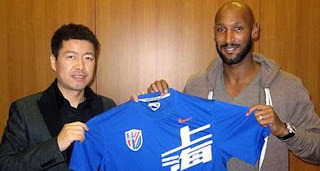 The signing of Anelka and pursuit of other marquee players is evidence of the growing financial might of Chinese clubs. Anelka's arrival would have a major impact on Chinese football, he added. The 32-year-old would raise the standard of football in the country but he would also set an example to young people and inspire them to take up the game.